Successfully Added Kremlin Camera Watch - Motion Detection, Waterproof, 30FPS AVI Video to your Shopping Cart. Rugged, covert, and waterproof...The Kremlin i87 master series watch captures surveillance video as well as you capture rogue and enemy agents! Devilish Design: It looks like a perfectly normal high and luxury watch. Something you'd expect from Omega, Breitling, even Rolex. It comes lavishly encased in stainless steel with a high and safety clasp and is visually distinct with its pro-chronometer stylings. But there's more than meets the eye with The Kremlin. Direct your attention just below the numeral 6. There you'll find ingeniously camouflaged against a matte black background, a powerful yet tiny videocamera lens which lets you capture secret surveillance audio and video with the press of a button. Easy To Use: The Kremlin features one button record and comes with 4GB internal flash memory for hours of high quality AVI format video footage. To view your recordings, simply connect The Kremlin to your PC or laptop with the USB included then drag the files from the watch to your desktop. Because the videos are in AVI format (the most popular video format on the Internet) pretty well all types of players including Videolan will be able to run it no problem. So much more...: The Kremlin isn't just great looking, it's great functioning too with enough features like motion detection to make it the ideal accomplice whether your intentions are noble or not. Take videos of your kids swimming or take videos of their gorgeous swim instructor for example. Take video class notes or video the professor getting down and dirty with Mary Ann for example. The possibilities for fun and functionality are endless! Elegantly designed and offering exceptional quality, The Kremlin watch is just a click away. Order yours today and we'll ship it out tomorrow. Available to you at a factory direct wholesale price from the leader in wholesale electronics, Chinavasion. This product comes with two microphone caps. A normal one for audio use and a second waterproof one for underwater use. Using the normal cap underwater will expose the insides of the watch to water. How can I reset the watch? Press the mode key and operating key at the same time. 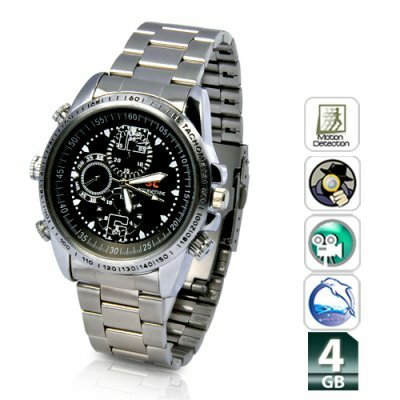 I had bought one of these watches and it records really good video.You could just use your imagination with it.You can use it for all those exiting moments.Its A blast to have. Great quality product - usual quick delivery. Looks great and the camera lens is hard to find.